Determine what is expected from the seal. Select the proper Heatseal Band for the job. Which sealing mode is best for this application? Select a facing for the jaw. Keep the hot plastic from sticking. When to heat and when to cool. Pick the right controller for the job. ROPEX Resistron (RES) Heatseal Temperature 400 Series Controllers utilize digital technology and are universally adaptable to almost every heat sealing application. The models RES-407 and RES-408 are designed for “in cabinet” mounting to protect the controller from such hazards as untrained personnel and chemical washdown. The RES-420 and RES-440 are panel mounted for easy access and visibility. Standard RES-Controllers are somewhat limited in power, but Booster Systems are available for loads as high as 15 KVA. Applications with heavy loads or prolonged sealing cycles require special consideration. Please consult the Application Engineers at TOSS for assistance in your system design. Click for information on new EtherNet/IP controllers. 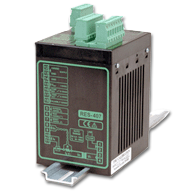 Click for information on new PROFINET controllers. 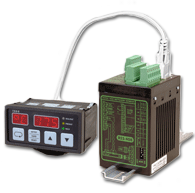 This versatile controller can interface with your PLC controls. It will respond to both “START” and analog “Temperature Control” signals and will feedback actual heatseal band temperature in real time. Important features include Auto-calibration and Fault Detection including Heatseal Band break, parallel band break, and ground fault detection. An overheat detection circuit activates an “Alarm” which, in turn, will shut down the system in the event of fault. A 24 VDC auxiliary power supply is required. A panel mounted key-pad with a menu driven LED display is the outstanding advantage of this “in cabinet” controller. Seal Temperature and Preheat Temperature are displayed in real time or “hold” mode. Fault Detection features include error diagnosis in the event of an “Alarm” and both Pre-heat and Seal Heat can be activated remotely. AutoCal simplifies the calibration process and an analog temperature output is also included for feedback to a meter or datalogger. Most useful, this panel mounted controller has a key-pad and Vacuum Fluorescent Display (VFD) to select and display Pre-heat Temperature, Seal Temperature, Heating and Cooling Time, as well as Alarms and Fault Descriptions. Other features include; AutoCal, Analog Temperature Output, Preheat and Booster Modes, selectable Temperature Ranges, ­programmable time sequence, and most important, fully inter-changeable with all 200 Series panel mounted controllers. Similar to the RES-440, this controller is less costly than the RES-440. Features include LCD Temperature Display, AutoCal, Fault Alarm, Booster output and selective error diagnosis. It is inter-changeable with the RES-210, 211, 220, and the 221. A list of controllers is provided to illustrate some of the various models that are available. When designing a system it is best to consult for assistance in making the final selection. In-Cabinet vs Panel Mounted – Which "Plug and Play" Resistron RES Controller is right for you?